The primary technology we use to receive flight data is called Automatic Dependent Surveillance-Broadcast (ADS-B). This relatively new technology enables us to track aircraft in real-time with great accuracy. As ADS-B becomes industry standard the number of flights we are able to track will rise. Automatic means there is no input required on the part of the flight crew for the system to work. Dependent means the system is dependent on satellite navigation (GPS) to acquire position information. Surveillance in this case means the location of the aircraft is known. And Broadcast means the aircraft is broadcasting its position. ADS-B is becoming more prevalent and will eventually become the standard for air traffic control in most areas. Canada is one of the few countries already using ADS-B for air traffic control. The adoption of ADS-B is a large part of the NextGen project in the United States as well as the SESAR initiative in Europe. By using GPS-based navigation data for air traffic control, flights will be able to navigate more efficiently. Our estimations show that roughly 70% of all commercial passenger aircraft (75% in Europe, 55% in the US) are currently equipped with an ADS-B transponder. For general aviation this number is probably below 20%. This number will continue to rise through 2020, when most commercial aircraft around the world will be required to use an ADS-B transponder. ADS-B equipped aircraft acquire position information from satellite navigation (GPS). That information—along with other information about the aircraft, including speed, heading, and altitude information—is then broadcast from the aircraft and picked up by a receiver connected to the Flightradar24 network. The receiver feeds data to us and is displayed on our site and in our apps. ADS-B tracking takes less processing power than our other tracking technology MLAT, because the aircraft is directly providing the information we need. 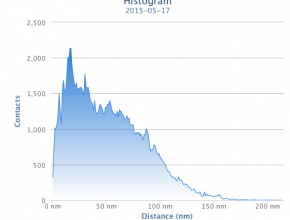 A histogram of the range of one of our receivers in a major American city. Flightradar24 maintains over 7,000 receivers around the world that feed ADS-B data our network. Each receiver is limited in range from 250-450 km (150-250 mi) due to the high frequency (1090 MHz) on which ADS-B operates. To eliminate gaps in coverage we’re continually adding receivers. 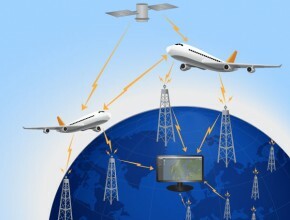 The further an aircraft is from a receiver, the higher the aircraft must be flying to be covered by a receiver. These limitations make achieving oceanic ADS-B coverage difficult, but we’re currently working on developing solutions to this problem. In Europe, our ADS-B coverage is approximately 99%. We also maintain good ADS-B coverage in the United States, Canada, Mexico, the Caribbean, Brazil, Russia, the Middle East, India, Japan, Thailand, Malaysia, Indonesia, Australia and New Zealand. We’re currently focusing on expanding coverage in China and throughout Africa. We recently activated our 100th receiver for the year in Africa. If you’d like to help us increase our coverage by hosting a receiver, please apply here or see our post on the application process. And you can always send us a message contact us on Facebook or Twitter if you have any questions.